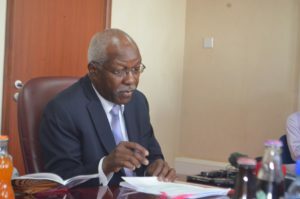 Auditor General John Muwanga. Photo by Vincent Kasozi. KAMPALA–A local firm Kisaka and Company audit firm has been appointed by Parliament to audit the Office of the Auditor General. The move is in line with article 163 (9) of the 1995 Constitution. The article states: “The accounts of the office of the Auditor General shall be audited and reported upon by an auditor appointed by Parliament”. The development follows several failed attempts to find an audit firm. The failure has left the Office of the Auditor General unaudited for the last 12 years. In 2012, Parliament rejected M/S Chege Muchunguzi and Mwangi and Company Consortium over failure to provide evidence of practice in Uganda. Kisaka and company audit firm was given the nod yesterday, even though some MP queried the competence of the firm. Robinah Nabanja, a Parliamentary Commissioner and Kakumiro District Woman MP, presented the bid results to Parliament. She said Kisaka and company met all the bid requirements and had the highest total of both technical and financial scores, according to the bidding. Kisaka and company outcompeted BDO East Africa and Tomson and company early this year. Some MPs were in favour of contracting an international audit firm for the task. Charles Ilukor, the Kumi County MP, noted that he was not aware of M/S Kisaka being even among the top 20 audit forms in the country. “The commission is, therefore, yet to convince me although they have their own attributes that M/S Kisaka can do a good job for Parliament,” he said. But David Abala, the Ngora County MP, called for the house to support local content by approving the successful audit firm. He said it was unfair to give a vote of no confidence to the Parliamentary Commission and discredit Kisaka and company audit firm without giving it the benefit of doubt. Gen Ely Tumwine, the UPDF Representative in Parliament, agreed with Abala, noting that M/S Kisaka should be given a chance to perform. “We can audit the auditor if he doesn’t perform, rather than start from negative, from suspicion, from allegation as if he has already not performed,” the decorated general implored. Parliament eventually adopted the Parliamentary Commission’s report under the guidance of the deputy Speaker, Jacob Oulanyah.